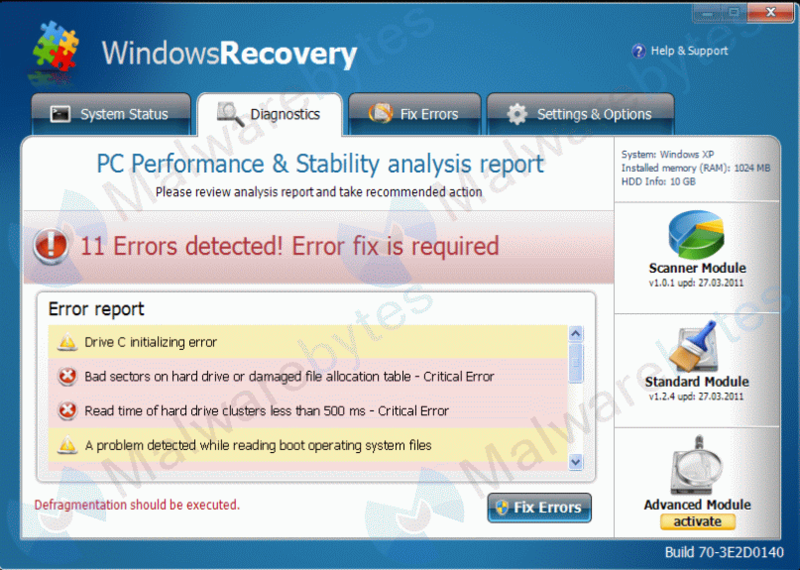 The Malwarebytes research team has determined that Windows Recovery is a fake anti-malware application. These so-called "rogues" use intentional false positives to convince users that their systems have been compromised. Then they try to sell you their software, claiming it will remove these threats. In extreme cases the false threats are actually the very trojans that advertise or even directly install the rogue. You are strongly advised to follow our removal instructions below. 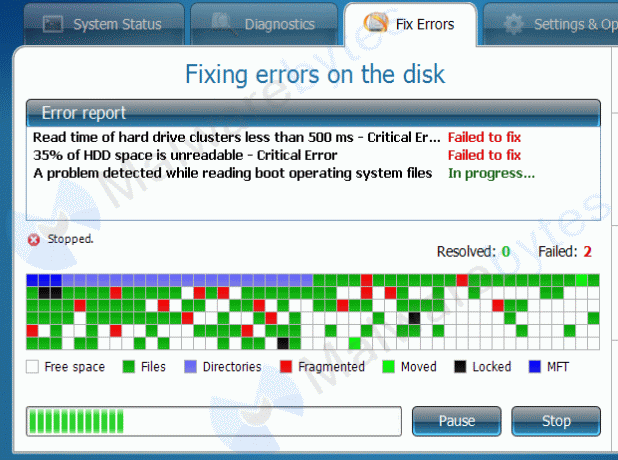 How do I know if I am infected with Windows Recovery? 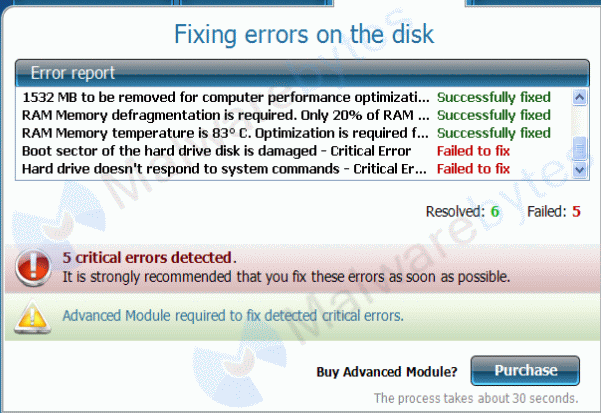 How did Windows Recovery get on my computer? Rogue programs use different methods for spreading themselves. This particular one was offered as a flash player. 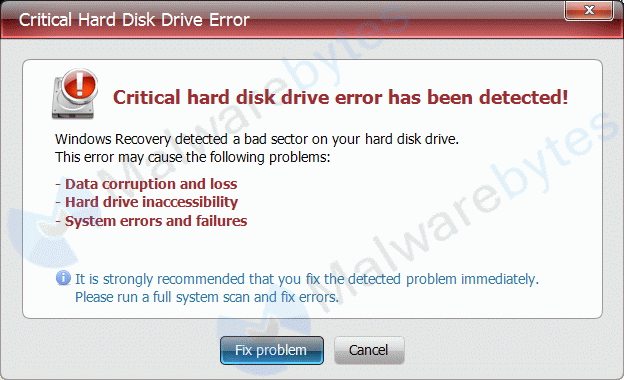 How do I remove Windows Recovery? Is there anything else I need to do to get rid of Windows Recovery? 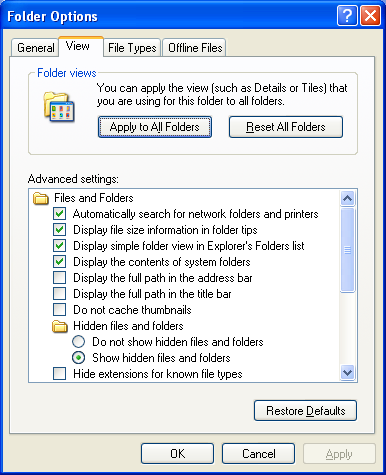 The shortcut called Windows Recovery on the desktop can be deleted if it belonged to the rogue. As you can see below the full version of Malwarebytes' Anti-Malware would have protected you against the Windows Recovery rogue. It would have warned you before the rogue could install itself, giving you a chance to stop it before it became too late. "BD"="C.:.\.D.o.c.u.m.e.n.t.s. .a.n.d. .S.e.t.t.i.n.g.s.\.A.l.l. .U.s.e.r.s.\.A.p.p.l.i.c.a.t.i.o.n. .D.a.t.a.\.1.8.4.0.7.2.2.0...e.x.e..."
"JgUJevQpNnePtDM"="'C:\Documents and Settings\All Users\Application Data\JgUJevQpNnePtDM.exe'"
c:\documents and settings\all users\application data\jgujevqpnneptdm.exe (Trojan.Downloader) -> 1920 -> Unloaded process successfully. c:\documents and settings\all users\application data\18407220.exe (Rogue.FakeHDD) -> 2016 -> Unloaded process successfully. HKEY_CURRENT_USER\SOFTWARE\Microsoft\Windows\CurrentVersion\Run\JgUJevQpNnePtDM (Trojan.Downloader) -> Value: JgUJevQpNnePtDM -> Quarantined and deleted successfully. c:\documents and settings\all users\application data\jgujevqpnneptdm.exe (Trojan.Downloader) -> Quarantined and deleted successfully. c:\documents and settings\all users\application data\18407220.exe (Rogue.FakeHDD) -> Quarantined and deleted successfully.